I hadn’t heard much in a while about sarilumab, fully human monoclonal antibody (MAB) against IL-6R alpha. So I have been very interested in presentations at the EULAR 2014 Meeting in Paris. M. Genovese and colleagues presented: “EFFECTS OF SARILUMAB PLUS MTX ON CLINICAL, RADIOGRAPHIC, AND FUNCTIONAL ENDPOINTS IN PATIENTS WITH MODERATE-TO-SEVERE RHEUMATOID ARTHRITIS: RESULTS OF A PHASE 3, RANDOMIZED, DOUBLE-BLIND, PLACEBO-CONTROLLED, INTERNATIONAL STUDY”. N=1197!!! Conclusions: “In this phase 3 study, both sarilumab doses (150 mg and 200 mg q2w), in combination with MTX, demonstrated efficacy in pts with active RA who had inadequate response to MTX. Both sarilumab doses met clinical, radiographic, and functional endpoints. Clinical response was maintained throughout the 52-wk study period. Infection SAEs and laboratory abnormalities with sarilumab are consistent with IL-6 signaling blockade.” This looks much better than the studies presented a year ago. I’m a bit more confident in the future of sarilumab. At least it looks much better than a year ago. This year I’d like to say: sarilumab get to the market! Hope it won’t take too long. Einer unserer Patienten brachte uns einen Zeitungsausschnitt zu CollaSan mit. „Wie Sie mit natürlichen Vitalstoffen Rheuma, Arthrose, Gelenkverschleiß in nur 7 Wochen stoppen“. Da hatte ich schon einen Koller! Wieso sieben Wochen? Wieso nicht 6, 12 oder 24 Wochen? Wieso sollte man ganz unterschiedliche Erkrankungen völlig identisch behandeln können? Wieso werden Kupfer, Mangan und Vitamin C als „Extrakte von Mutter Natur“ genannt? Kupfermangel ist eine sehr seltene Erkrankung. Kupferüberschuss hingegen kann durch die Einnahme von Kupfertabletten entstehen und zur Kupfervergiftung führen. Die durchschnittliche Manganversorgung der Bevölkerung ist deutlich besser als der Bedarf. Der Bedarf wird mit 1 mg Mangan täglich angegeben, die Versorgung beträgt aber 2,5 mg.
Das Erfolg-Geheimnis, das im Werbetext auf die vier Wirkstoffe zurückgeführt wird, führe ich auf die Gutgläubigkeit der Käufer zurück. 60 Kapseln kosten etwa 50 Euro. Da rate ich wieder einmal: passen Sie auf Ihren Geldbeutel auf! Clinical and histopathological evaluation of MDP/collagen induced arthritis rat model (MCIA) after treatment withUrtica dioica, plantago major and Hypericum perforatum L herbal mixture. Ich habe dieser Tage ein zwölfseitige Beilage in einem Magazin gefunden; Titel: "Die wohltuende Kraft der Heilkräuter". Auf der ersten Seite sieht man Blumen und das Kräuterhaus ("Sanct Bernhard"), aus dem die Wunder der Natur in die Welt gehen, und ein Hinweis auf die gratis Magnesium 400 Supra-Kapseln. Gratis zieht in Deutschland immer Käufer an, die nicht verstehen wollen, dass es nichts gratis gibt. Aber das ist eine andere Geschichte. Ich schaue mir das Angebot an und sehe, dass die Nahrungsergänzungsmittel überwiegen. Somit die reine Mogelpackung! Was haben Grünlippmuschel, Calcium+D3, Omega-3 Supra-1000, Magnesium, Omega-3 Fischöl, Vitamin B12, Krillöl, Chondoitin und Glucosamin, sowie Arginin mit Kräutern zu tun? Haferflocken, Haselnüsse, Sojabohnen, Walnüsse, Weizenkeime sind reich an Arginin; den höchsten Arginingehalt weisen übrigens Erdnüsse auf! Für Vitamin D3 muss man eine Ausnahme machen und vielleicht noch zu Vitamin B12, aber dann nur, wenn keine Nahrungsquelle vorhanden ist, wie das z.B. bei Veganern der Fall sein kann. ABT-122 is an anti-TNF/IL-17 Dual Variable Domain immunoglobulin (DVD-Ig™). It had been "demonstrated that dual neutralization of TNF and IL-17 provides greater efficacy than blocking either cytokine alone in mouse collagen induced arthritis". Allow me to voice my skepticism already at this point. M. Genovese and colleagues have presented a study two years ago, in which secukinumab (an anti-IL-17a MAB) has been studied in patients with rheumatoid arthritis still active despite methotrexate therapy. “Primary endpoint was the proportion of patients achieving American College of Rheumatology (ACR) 20 at wk16.” This endpoint hadn’t been achieved. I'm not convinced that IL-17-inhibition is working in rheumatoid arthritis, but let's come to the study, which has been presented in Paris. C. Cuff and colleagues presented this study: "DUAL NEUTRALIZATION OF TNF AND IL-17 WITH A DVD-IG PROTEIN IS EFFICACIOUS IN COLLAGEN INDUCED ARTHRITIS". A mouse study! Conclusions: "These data demonstrate that dual blockade of TNF and IL-17 with a DVD-Ig™ molecule is efficacious in a pre-clinical model of arthritis and support the rationale to clinically evaluate the anti-human TNF/IL-17 DVD-Ig protein, ABT-122, in rheumatoid arthritis and other inflammatory disorders." I would expect a benefit in " other inflammatory disorders" like psoriatic arthritis or anylosing spondylitis. But ... I have my reservations. Blocking two cytokines at the same time has been avoided so far. All combinations look at a biologic DMARD (boDMARD) and a conventional/chemical DMARD (csDMARD) and not two biologics. The fear is high that one induces more side effects. Even if further studies prove, that ABT-122 isn't working in rheumatoid arthritis, it might open Pandora's box to study combinations of two biologic DMARDs. 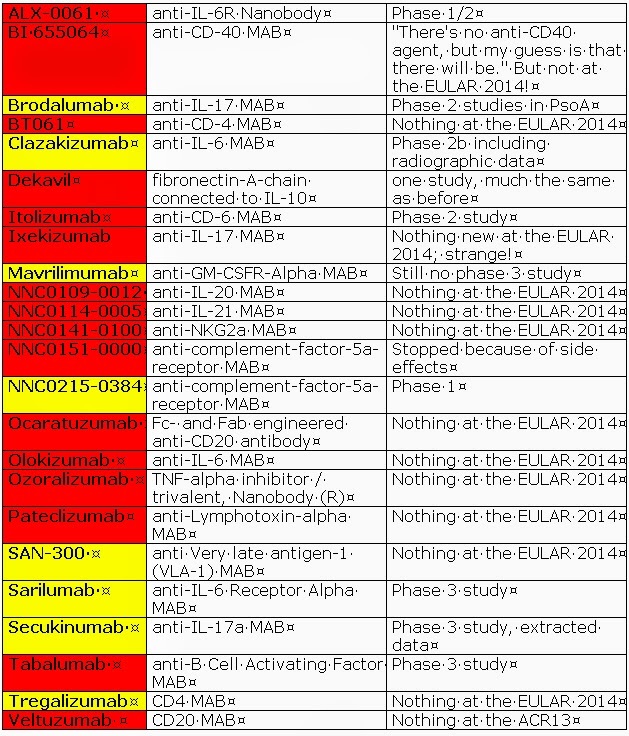 Two years ago, I’ve already posted about sirukumab (formerly known as CNTO 136), which is a human anti-IL-6 MAB. B. Hsu and colleagues presented a phase 2 study. I asked myself, if there is a market for sirukumab in rheumatoid arthritis, as tocilizumab is already there (and now with an SC option) sirukumab needs methotrexate as co-medication. At the EULAR 2014 Meeting in Paris there hasn’t been a study on sirukumab on rheumatoid arthritis. But there has been a study on lupus nephritis. R. van Vollenhoven and colleagues presented a study: “A PHASE 2, MULTICENTER, RANDOMIZED, DOUBLE-BLIND, PLACEBO-CONTROLLED, PROOF-OF-CONCEPT STUDY TO EVALUATE THE EFFICACY AND SAFETY OF SIRUKUMAB IN PATIENTS WITH ACTIVE LUPUS NEPHRITIS”. Conclusions: IL-6 inhibition with sirukumab in pts with active lupus nephritis did not result in a median improvement in proteinuria, however approximately 15-20% of treated patients did show a notable reduction in proteinuria. A high frequency of serious adverse events was observed in this population of immunosuppressed patients with refractory lupus nephritis.” Read between the lines. Sirukumab doesn’t seem to be doing good job. Does this dim the outlook for sirukumab? Maybe not. The SIRROUND-LTE study on long-term safety and efficacy of sirukumab in rheumatoid arthritis (a phase 3 study) is still recruiting. Therefore we still have to wait, even if there wasn’t new data at the EULAR 2014 Meeting. So we see further use of IL-33/ST2 as a marker, but we don’t know more about “the role of the IL-33/ST2 axis in B-cell immunopathology in RA”. There were two more studies, one on Sjogren’s syndrome and one on Adult Onset Still’s Disease. Itolizumab (Alzumab by Biocon) is a humanized IgG1 MAB that selectively targets CD-6, which is involved in co-stimulation, adhesion, and maturation of T cells. Itolizumab down regulates T cell activation and so reduces synthesis of pro-inflammatory cytokines. It has already been approved by the Drugs Controller General of India (DCGI) for the treatment of chronic plaque psoriasis. Now, itolizumab has been introduced to the rheumatogy public with one study. But this study is worth mentioning. I guess, we’ll hear more of itolizumab. As there is an unmet need of new and effective drugs in psoriatic arthritis; this might be one of these. Iguratimod (T-614) is a novel disease modifying anti-rheumatic drug (DMARD). Iguratimod is characterized by inhibitory effects on immunoglobulin production in B cells as well as inhibiting cytokine production. Its' mode of action comes by suppression of nuclear factor kappa B (NF-kB) activation. As I have already written this before, please look for the links below. 2012 there had been three studies, 2013 one study at the EULAR Meeting in Madrid (a study by a Chinese group) and also only one study at the ACR 2013 Meeting. This time there have been three posters/abstracts on iguratimod. But alas, all with a very limited number of patients. K. Kume and colleagues presented: "THE EFFICACY AND SAFETY OF IGURATIMOD IN RHEUMATOID ARTHRITIS PATIENTS WITH CHRONIC RENAL FAILURE". Conclusions: "Iguratimod was effective and safety in RA patients with chronic renal failure. Iguratimod could be used for RA patients with chronic renal failure." But: N=21, of whom 18 completed the study! K. Okamura and colleagues presented: "CLINICAL EFFICACY OF THE SYNTHETIC ANTI-RHEUMATIC DRUG, IGURATIMOD". Conclusions: "Our results suggest that IGU is clinically one of the useful synthetic DMARDs to RA patient." N=41 over 24 weeks. No placebo controlled study. Y. Hirano looked at: "INFLUENCES OF DISEASE ACTIVITY AT INITIATION OF IGURATIMOD, A SMALL-MOLECULE ANTIRHEUMATIC DRUG, ON EFFICACY OF IGURATIMOD IN PATIENTS WITH RHEUMATOID ARTHRITIS: A MULTICENTER STUDY". Conclusions: "More treatment options other than sufficient MTX and BIO are needed in RA patients with concomitant disease such as lung disease or renal dysfunction. High cost of BIO is another issue to inhibit improvement of signs and symptoms in RA patients. This study suggests that IGU is one of the options not only in RA patients treated with sufficient MTX but also in RA patients with high disease activity treated with insufficient MTX." N=34 over 24 weeks. I think iguratimod has shown to be a promising candidate for treatment of active rheumatoid arthritis and might become a needed alternative in the conventional (traditional) DMARD class, but the sponsor of studies must show more commitment. Now, we don't need more of the above studies. What we need are double-blind placebo controlled studies with enough patients over a longer period of time. And we need data, if radiographic progression is inhibited or not. Iguratimod - go for it! Tofacitinib (Xeljanz®) had a negative opinion for marketing authorization in Europe by the Committee for Medicinal Products for Human Use (CHMP) of the European Medicines Agency (EMA) about a year ago. The issueas had been: an insufficient demonstration of a consistent reduction in disease activity and structural damage to joints; moreover the CHMP had also been concerned about serious infections, gastrointestinal perforations, and malignancies as observed in studies. At the EULAR 2014 Meeting in Paris tofacitinib has been present in quite a lot of studies. These studies show the commitment of the company to get tofacitinib approved in Europe. 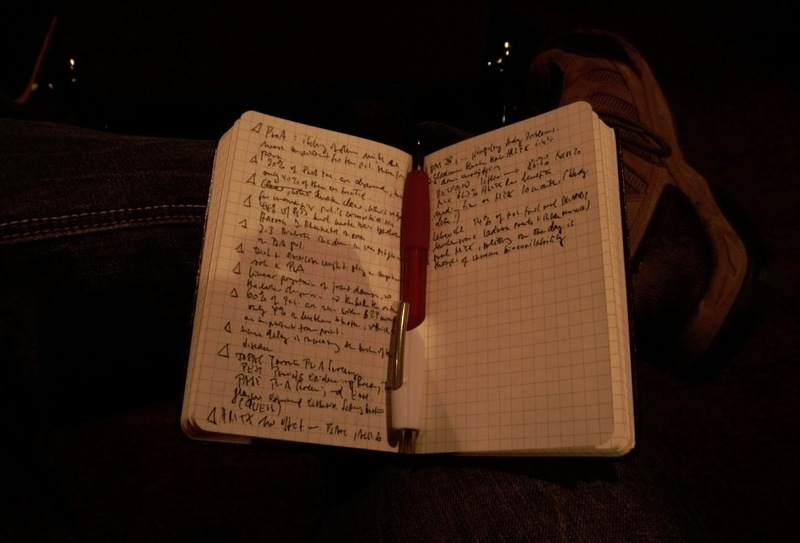 I'll show the studies at the end of this blogpost. K. Katayama and colleagues presented: "LONG TERM RESULTS OF INHIBITION OF RADIOGRAPHIC JOINT DAMAGE PROGRESSION IN SMALL AND MEDIUM AND LARGE JOINTS IN PATIENTS WITH RHEUMATOID ARTHRITIS TREATED WITH TOFACITINIB MONOTHERAPY". Conclusions: "Progression of small and M-L sized joints were effectively inhibited by tofacitinive mono-therapy." The study shows 4 year data, but only for N=8. and Cmax of the MR and IR formulations of tofacitinib. Single doses of both formulations were well tolerated. This novel MR formulation of tofacitinib facilitates an opportunity to enable QD dosing, while maintaining systemic drug concentrations similar to the IR formulation (administered BID)." As N=26 isn't adequately powered: "Multiple-dose studies will be conducted to confirm the predictions of the SS PK profile and demonstrate equivalence between formulations following SS dosing." We don't know if the studies to demonstrate a consistent reduction in disease activity and structural damage to joints have come so dar to be published soon. But we know, that we have at least another year to wait for tofacitinib (Xeljanz®). I've listed the newer biologics. Already I've marked some red as there haven't been new studies for a long time or an old study had been presented. This traffic light rating is subjective, but I think it may be helpful. None could be marked green as none is near approval as a drug. Brodalumab is doing fine, but the phase 3 study needs further recruiting. Ixekizumab seems to be abandoned as nothing has been published at the EULAR 2014 Meeting and usually the companies see that they publish a minor study. Secukinumab (anti-IL-17a MAB) showed data of a phase 3 study. Clazakizumab showed a phase 2b study including radiographic data; I think that's promising. 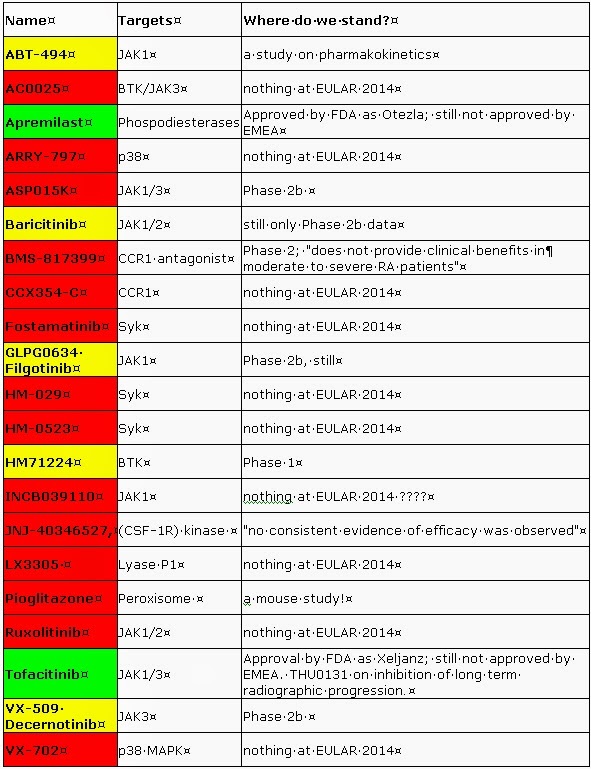 Olokizumab seems to be abandoned as nothing has been published at the EULAR 2014 Meeting. Sarilumab (anti-IL-6 Receptor Alpha MAB met clinical, radiographic, and functional endpoints in a phase 3 study. Itolizumab showed results, that "provide strong preliminary evidence for the safety and efficacy". There's only one MAB and it's called dekavil. 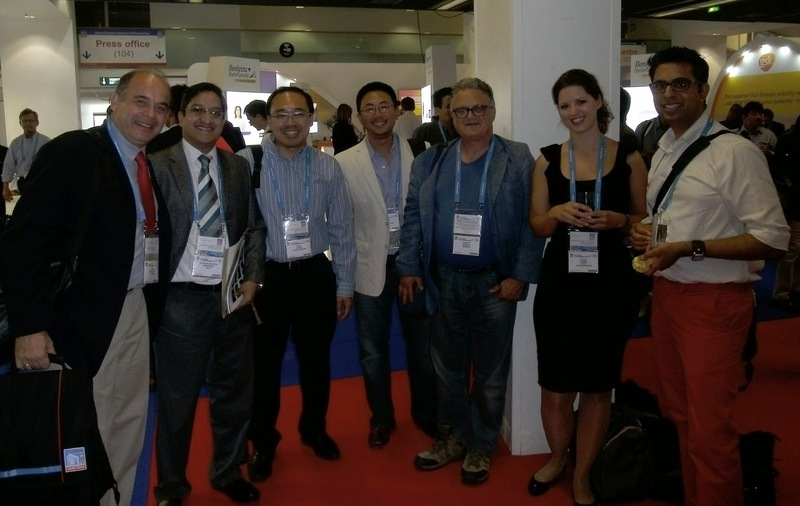 The study group presented 7 patients at the EULAR 2013 Meeting, 14 patients at the ACR 2013 Meeting, and now 20 patients. The patients were recruited in four different centers. I don't see the future of this approach as favourable as the authors. Mavrilimumab has been presented in two studies, but no phase 3 study, but I guess that recruiting is a problem. NNC0151-0000 has been stopped because of side effects. NNC0215-0384 is in phase 1. Tabalumab has been presented with a phase 3 study (N=456) in two abstracts, but "demonstrated no clinical efficacy despite evidence of biologic activity, suggesting that targeting BAFF may not be a viable therapeutic approach to treating pts with RA." Quite a lot of dead ends! But some interesting developments to get drugs with new modes of action as some of the existing options might not work due to class effects. There have been two studies on mavrilimumab at the EULAR 2014 Meeting in Paris. Compared to the three studien presented the the ACR 2013 Meeting in San Diego this is a step backwards, no matter how interesting the studies themselves might be. Still no phase 3 study with stressable data on radiographic progression. So it means for us waiting longer to see, if mavrilimumab matured into a usable drug. Again Id like to look how much hype or hope lies in protein kinase inhibitors. Xeljanz (tofacitinib) is on the market in the US for rheumatoid arthritis, but still lacks approval in Europe. Otezla has been approved in the US for psoriatic arthritis, but also waits for approval in Europe. There is light, but there are also some deep black shadows. A. Kavanaugh and colleagues presented: "APREMILAST, AN ORAL PHOSPHODIESTERASE 4 INHIBITOR, IS ASSOCIATED WITH LONG-TERM (52-WEEK) IMPROVEMENT IN MEASURES OF DISEASE ACTIVITY IN PATIENTS WITH PSORIATIC ARTHRITIS: RESULTS FROM 3 PHASE 3 [The PALACE 1, 2, and 3], RANDOMIZED, CONTROLLED TRIALS". Conclusions: "APR demonstrated clinically meaningful improvements in measures of PsA disease activity throughWeek 52. APR demonstrated an acceptable safety profile and was generally well tolerated through 52 weeks." A. Adebajo and colleagues presendted the PALACE 4 study: "LONG-TERM SAFETY AND TOLERABILITY OF APREMILAST, AN ORAL PHOSPHODIESTERASE 4 INHIBITOR, IN PATIENTS WITH PSORIATIC ARTHRITIS: A PHASE 3, RANDOMIZED, CONTROLLED TRIAL" . Conclusions: "APR demonstrated an acceptable safety profile and was generally well tolerated for up to 52 wks; the nature, incidence, and severity of AEs were comparable over the 24-wk and 52-wk periods. Similar to data from other phase 3 trials assessing pts previously treated with DMARDs, these data do not indicate a need for laboratory monitoring." C. Edwards and colleagues presented: "APREMILAST, AN ORAL PHOSPHODIESTERASE 4 INHIBITOR, IS ASSOCIATED WITH LONG-TERM (52-WEEK) IMPROVEMENTS IN ENTHESITIS AND DACTYLITIS IN PATIENTS WITH PSORIATIC ARTHRITIS: RESULTS FROM THE PALACE 4 PHASE 3, RANDOMIZED, CONTROLLED TRIAL". Conclusions: "Among pts continuously treated with APR through 52 wks, sustained improvements in both enthesitis and dactylitis were observed in pts with active PsA, who had enthesitis and dactylitis at BL. APR demonstrated an acceptable safety profile and was generally well tolerated for up to 52 wks." I think an important issue with patients suffering from psoriatic arthritis. Three more studies, but I miss data on radiographic progression and as this has been an issue with tofacitinib in Europe, I doubt that Otezla will get an approval without such data. Y. Tanaka and colleagues presented: "EFFICACY AND SAFETY OF BARICITINIB IN JAPANESE RHEUMATOID ARTHRITIS PATIENTS AT 12 WEEKS". Conclusions: "Clinical efficacy was demonstrated in this Phase 2b study of baricitinib in combination with background MTX in Japanese RA pts through 12 weeks. Safety signals observed through 12 weeks were consistent with a previous study of baricitinib in non-Japanese pts with RA." And that's all there is. I've talked to the Lilly people and they told me that phase 3 studies haven't completed recruiting. So we still have to wait for these important studies. F. Namour and colleagues presented: "DOSE SELECTION OF GLPG0634, A SELECTIVE JAK1 INHIBITOR, FOR RHEUMATOID ARTHRITIS PHASE 2B STUDIES: PK/PD AND EXPOSURE-DAS28 MODELING APPROACH". Conclusions: "Current modeling and simulation on the basis of early clinical data suggests that the pharmacokinetics of GLPG0634 is dose proportional at doses up to 200 mg QD, in agreement with observed data, and shows that both GLPG0634 and its main metabolite contribute to biomarker response. Simulations of the pSTAT1 and DAS28 dose-response relation suggest that the efficacy is favorable up to a daily dose of 200 mg GLPG0634, with clinical response in the range of that observed with registered compounds. A daily dose range from 50 to 200 mg is currently being tested in the DARWIN Phase 2B program." Will take a couple of years until we see phase 3 studies. There has been a multitude of studies. For me the most interesting one is the following study. K. Katayama and colleagues presented: "LONG TERM RESULTS OF INHIBITION OF RADIOGRAPHIC JOINT DAMAGE PROGRESSION IN SMALL AND MEDIUM AND LARGE JOINTS IN PATIENTS WITH RHEUMATOID ARTHRITIS TREATED WITH TOFACITINIB MONOTHERAPY". Conclusions: "Progression of small and M-L sized joints were effectively inhibited by tofacitinive mono-therapy." Reads good, doesn't is? The only problem is: N=8. For this small number it's a big conclusion! Also some interesting data on psoriatic arthritis, but still lacking the data from well powered phase 3 studies on radiographic progression. So we still have to waitfor tofacitinib, in Europe that is. R. van Vollenhoven and colleagues presented: "A PHASE 2B, 24-WEEK STUDY OF VX-509 (DECERNOTINIB), AN ORAL SELECTIVE JANUS KINASE 3 INHIBITOR, IN COMBINATION WITH BACKGROUND METHOTREXATE IN RHEUMATOID ARTHRITIS". Conclusions: "All tested doses of VX-509 significantly improved signs and symptoms of RA versus placebo when administered in combination with stable background MTX therapy for 24 weeks. VX-509 was associated with small increases in AE rates, serious infections, and mostly minor laboratory abnormalities. These results support and provide guidance for the further development of VX-509." N=358! OK, just one big phase 2b study, but it looks promising. I think it will take a while until we see protein kinase inhibitors at bedside in Europe. J. Goncalves and colleagues were asking: "IN SEARCH FOR MAB BIOSIMILARITY: HOW TO OVERCOME OBSTACLES?" "The guidelines (of the European Medicines Agency (EMEA)) advocate pre-clinical and clinical testing of biosimilars prior to market authorization, complemented by tailored pharmacovigilance plans. These guidelines provide a valuable base from which to develop in this evolving regulatory environment." J. Braun taked on: "LATEST UPDATE ON BIOSIMILARS - CHANCES AND RISKS". "EMA and FDA regulations as well as scientific considerations indicate that biosimilarity does not imply interchangeability. In Rheumatology the first biosimilar has recently been approved in Europe – a biosimilar to infliximab which has passed all tests and examens and that is produced by a Korean company." It's Remsima by Celltrion. S.-C. Bae and colleagues presented: "A RANDOMIZED, DOUBLE-BLIND, PHASE 3 EQUIVALENCE TRIAL COMPARING THE ETANERCEPT BIOSIMILAR, HD203, WITH ENBRELR, IN COMBINATION WITH METHOTREXATE (MTX) IN PATIENTS WITH RHEUMATOID ARTHRITIS (RA)". HD203 is a biosimilar of etanercept. Conclusions: "The study met the primary endpoint of demonstrating equivalence in efficacy of HD203 compared with EnbrelR. HD203 was well tolerated, with a safety profile comparable to that of EnbrelR in this population of Korean patients with RA." HD203 is produced by South Korean Hanwha Chemical. J. Kay and colleagues presented: "A PHASE 3, RANDOMIZED, DOUBLE-BLIND, ACTIVE COMPARATOR STUDY OF THE EFFICACY AND SAFETY OF BOW015, A BIOSIMILAR INFLIXIMAB, IN PATIENTS WITH ACTIVE RHEUMATOID ARTHRITIS ON STABLE METHOTREXATE DOSES". Conclusions: "This is the first clinical trial of a biosimilar IFX to demonstrate and report the kinetics of response to treatment prior to the plateau phase. The comparable proportion of responders at each of these early time points and at the Wk 16 primary endpoint provides convincing evidence of therapeutic equivalence." So there's another infliximab biosimilar at the horizon, produced by Epirus Biopharmaceuticals, Inc. There have been updates on the PLANETRA study (infliximab biosimilar). P. Kaur presented the following study: "A RANDOMIZED, SINGLE-BLIND, SINGLE-DOSE, THREE-ARM, PARALLEL GROUP STUDY IN HEALTHY SUBJECTS TO DEMONSTRATE PHARMACOKINETIC EQUIVALENCE OF ABP 501 AND ADALIMUMAB: RESULTS OF COMPARISON WITH ADALIMUMAB (EU)". Conclusions: "Results of this phase 1 study demonstrated bioequivalence of ABP 501 following a single 40-mg SC injection relative to that from a 40-mg SC injection of adalimumab (EU). No new safety signals with ABP 501 treatment were identified." C. Udata and colleagues presented: "A PHASE I PHARMACOKINETICS TRIAL COMPARING PF-06438179 (A POTENTIAL BIOSIMILAR) AND INFLIXIMAB IN HEALTHY VOLUNTEERS (REFLECTIONS B537-01)". Conclusions: "This study demonstrates PK similarity of PF-06438179 to both infliximab-US and infliximab-EU and of infliximab-EU to infliximab-US. The 3 study drugs were generally safe and well-tolerated in this study." What, if Remicade will be available at a price level of Denusomab? But this study is phase 1! D. Yin and colleagues presented: "A PHASE I PHARMACOKINETICS TRIAL COMPARING PF-05280586 (A POTENTIAL BIOSIMILAR) AND RITUXIMAB IN SUBJECTS WITH ACTIVE RHEUMATOID ARTHRITIS WITH ACTIVE DISEASE IN TNF FAILURES (REFLECTIONS B328-01)". Conclusions: "This study demonstrates PK similarity of PF-05280586 to both rituximab-US and rituximab-EU and rituximab-EU to rituximab-US. All 3 treatments were generally well tolerated, with a low incidence of treatment-related AEs and discontinuations due to AEs." S. Narayanan: "RELATIONSHIP BETWEEN THE DURATION OF RHEUMATOLOGY PRACTICE EXPERIENCE AND LIKELIHOOD OF USE AND PERCEPTION TOWARDS BIOSIMILARS IN RHEUMATOID ARTHRITIS ARENA". Conclusions: "Rheumatologists perceptions varied based on their practiceexperience; among those with ≤10yrs of practice-experience, higher proportion stated being doubtful or less/not likely of prescribing biosimilars to eligible RA patients, and a higher proportion of them cited national treatment guidelines and lack of data from local country/market among key reasons preventing biosimilar use. Conversely, among those with >20yrs of practice experience, a lower proportion cited lack of treatment guidelines and lack of data from local country/market as key reasons preventing biosimilar use." Doesn't this look grim for the producers of biosimilars? U. Kronthaler and colleagues presented: "PRECLINICAL PK AND SAFETY ASSESSMENT OF THE PROPOSED ADALIMUMAB BIOSIMILAR GP2017, COMPARED TO HUMIRAR". The study has been done in rabbits and in cynomolgus monkeys. Conclusions: "Pre-clinical pharmacokinetic studies are a sensitive means to characterize proposed biosimilars compared to their reference product. Similar AUC and Cmax of GP2017 and HumiraR are shown here in two species, upon single or repeated s.c. administration. ..." Sandoz Biopharmaceuticals, Hexal AG also want a piece of the pie. F. Berghea and colleagues looked at: "BIOSIMILARS USE IN RHEUMATOLOGY - THE PATIENT PERSPECTIVE". Conclusions: "In few areas (but not everywhere) the patient’s knowledge about drug (copies) might be deeper than we expect; the socio-economic advantages of biosimilars seems to be fully understood; treating physician should made the choice and assume the responsibilities; in the absence of financial constrictions the idea of a free switch between originals an biosimilars doesn’t seem to have many adepts. The study reveals a great need for education and debate in this area in order to fully accommodate the concept of biosimilars in rheumatic patients." There seems to be a lot going on, but Remsima hasn't knocked on my door, yet. [SP0022] H. Thorseng reported about " Food as therapy – supporting healthy choices". The Danish Rheumatism Assosiation gives free information either through their website, their mailbox or their hotline advice service. On the free helpline "people with RMDs and their relatives can talk to a professional adviser e.g. a nutritionist." Another talk was by M. Cutolo, EULAR president, on Vitamin D status. He pointed out: "80% of the vit D needs are obtained through exposure to sunlight: ,,," " a sunscreen with a sun protection factor (SPF) of 8 reduces the capacity of the skin to produce vit D3 by >95%!" He advises to use dietary supplements and fortified foods, but I must add that fortified foods aren't available everywhere due to legislation. Vitamin D is available as D2 (ergocalciferol) and D3 (cholecalciferol). he suggested taking 1,500 -2,000 IU per day during in winter. K. Betteridge's talk has been on "FOOD CHALLENGES - GETTING IN; GETTING IT ON; GETTING IT OFF". His conclusion: "With the right information, motivation and support, it is possible to make healthy choices in order to maintain a healthy diet when living with an RMD [people with rheumatic or musculoskeletal diseases]." J. Richardson talked on "EHEALTH LITERACY ON RHEUMATIC DISEASES: ANALYSING THE POWER OF THE INTERNET: HEALTH TALK ONLINE - PATIENTS’ EXPERIENCE OF GOUT". In his talk he pointed out: " Many people found a lot of conflicting and confusing information about diet and complementary treatments on the internet." And that is true for other diseases as well. Y. Matsumoto and colleagues lokked at "INTAKE OF MONOUNSATURATED FATTY ACIDS AS COMPONENTS OF A MEDITERRANEAN DIET SUPPRESSES RHEUMATOID ARTHRITIS DISEASE ACTIVITY – THE TOMORROW STUDY". T&he study showed that RA patients' intake is lower than of healthy volunteers. However, a high intake of MUFA was an independent predictor of remission in patients with RA. The authors concluded: "The daily intake of MUFA, a component of the Mediterranean diet, might suppress disease activity in patients with RA." B. Sundstrom and colleagues presented: "HIGH SODIUM INTAKE AMONG SMOKERS IS A RISK FACTOR FOR ACPA POSITIVITY IN RA". Conclusions: "High dietary intake of sodium among smokers was associated with an increased risk to develop ACPA positive RA and there was a significant interaction between the two environmental factors – sodium intake and smoking in conferring to this increased disease risk." These findings should find way into preventive medicine. Once the avanlanche is started it runs down. So we have to warn more against smoking and high intake of sodium. S. Abou-Raya and collegues looked at "NUTRITIONAL STATUS IN RELATION TO INFLAMMATORY AND OXIDATIVE STRESS MARKERS: ASSOCIATION WITH DISEASE ACTIVITY IN PATIENTS WITH SYSTEMIC LUPUS ERYTHEMATOSUS". They found 27% of pats. were obese, while 10% were malnourished. " The dietary intake assessment showed a lower intake consumption of fresh fruit, vegetables, milk and other dairy products and an increased intake of fats and oils. Low intake of iron, calcium and zinc was found in 35%, 58% and 78% respectively." In their conclusions they stated: "Interventions aimed at promoting adequate nutritional status may have beneficial effects by decreasing inflammation and oxidative stress and thus may contribute to reduction of comorbidities and improved quality of life in these patients." POLARIZATION". Results: "NaCl promoted the induction of Th17 cells from PBMC in RA patients. Th17 differentiation was progressively upregulated as NaCl concentration increased upto 60 mM. Correspondingly, high salt diet exacerbated the arthritis of CIA mice." Conclusions: "This study suggests that NaCl can aggravate arthritis via Th17 differentiation. High salt condition can contribute to the development and progression of RA." Another hint to advocate low sodium diets to people with rheumatic or musculoskeletal diseases. B. Sundstrom and colleagues looked at: "DIETARY PATTERNS, MACRONUTRIENTS AND ALCOHOL AS RISK FACTORS FOR RHEUMATOID ARTHRITIS". "The study included 386 individuals (271 women, 115 men) who previously had stated their dietary habits as part VIP (Vasterbotten Intervention Program= before the onset of symptoms of RA." Conclusions: "There were no significant associations of the dietary patterns studied on the risk for development of RA in this cohort. Neither were there any associations to the risk for RA with alcohol consumption and on diet examined as macronutrients." That's sobering! trials including 3 crossover trials." There were ony two trials on diet therapies. "Evidence was found for a reduction in inflammatory activity by adjusting to a Mediterranean or a calorie restriction diet. However, these diets were difficult to comply with and maintain in the long-term." Conclusions: "Supplementation of n-3 fatty acids, a low n-6 fatty acids intake and some diet therapies appeared to have a positive effect in patients with RA. However, most nutritional interventions cannot be effectively and safely recommended for the management of RA due to the limited number of trials, the inconsistencies between trials and the limits of applicability in patients’ daily life. The current evidence suggests that some supplements and suitable diet therapies may warrant further investigation." I think the last study is also the most interesting. Patients ask what they can do in form of dietary changes, but we still lack studies. I'll advise to stop smoking, lower intake of omega-6 fatty acids, increase omega-3 fatty acids, use olive oil, supplement viatmin D3, lower sodium intake. Advice, which isn't based on the above studies might include reducing meat, increasing fruits and veggies, reducing purines. Last year the air traffic controllers had been on strike and I've been late to the Tweetup. This year I thought better to use the train from Cologne to Paris. But then we had thunderstorms crossing the Northrhine Westfalia (NRW)damaging also railway connections and moreover the railway is one strike in France. So I took the car and had a pleasant journey out of heavy rain into nice weather. The sun was and currently is laughing out of a blue sky. But in Paris the taxi drivers are on strike, too. And they blocking road with their cars. So I arrived later than expected, but early enough to do a little sightseeing and start the congress. Oh, the taxi drivers again. They were honking their horns madly. And that's today's first session with Dr. Andrea Rubbert-Roth. Next have been some sessions and abstract viewing, which will end in some blogposts on new development, mostly concerning RA, PsA, and AS. But this will have to wait until after the meeting. And the Tweetup lies behind us, the better part of the EULAR 2014 Meeting in Paris lies ahead of us. Nearly all could attend. Thanks for coming and sharing news and visions again. Dr. Ai Lyn Tan excused herself as she wasn't able to find us. Too bad! 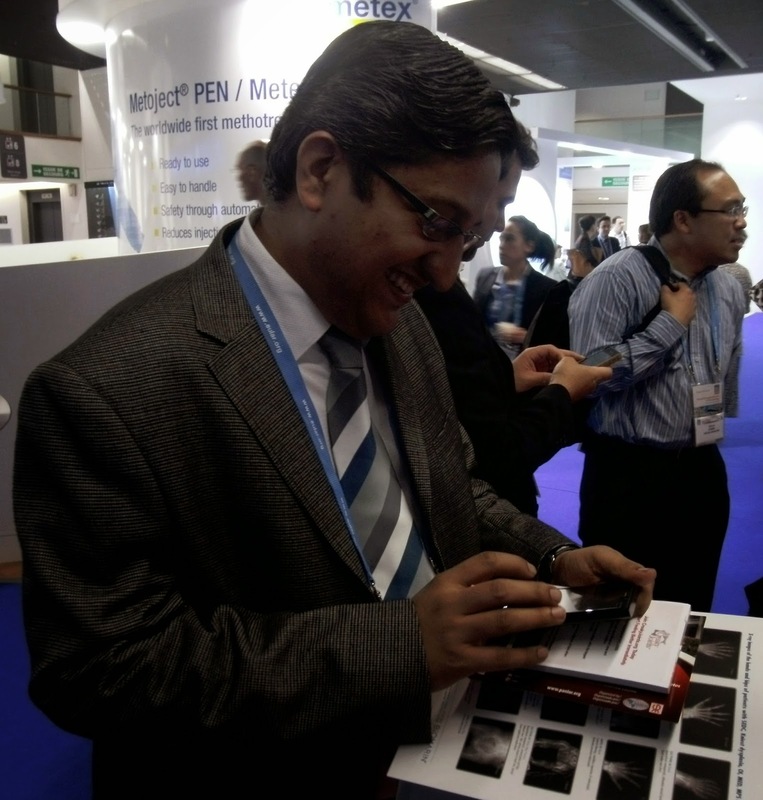 Dr. Shashank Akerkar ‏@doctorakerkar twittering about the tweetup! We definitely should have placed Abigail(ArthritisResTher ‏@ArthritisRes) in the front row. Last year there were more women supporting the Tweetup. We should have included a social meeting in the evening. Next time we'll do better. After the afternoon sessions and a late satellite symposium I went to the big Arch, then back to Montparnasse, just ready for a nice setting sun and some pictures of Sacre Coeur again. I've seen this building so often in the "Bourne Identity" that I believed having been there before, but I hadn't. this was the first time. Paris under a full moon. Sacre Coeur in the evening. No! Haven't been to the Tire Bouchon. This morning has been busy into the afternoon in on stretch of long sessions and poster viewing instead of "public viewing", oh, not what you think that's a new German expression for people watching football on a big screen. After the last session I went on a sightseeing trip together with Michiel Zandbelt (@zandbelt). Thanks, Michiel for organizing the itinerary, which proved to be magnifique. I enjoyed the talks about our experiences with health systems across the border. I've spent most of the time with poster viewing. Lots of interesting new development that will find entry onto this blog. During the afternoon I did some sightseeing before I headed back to Germany.